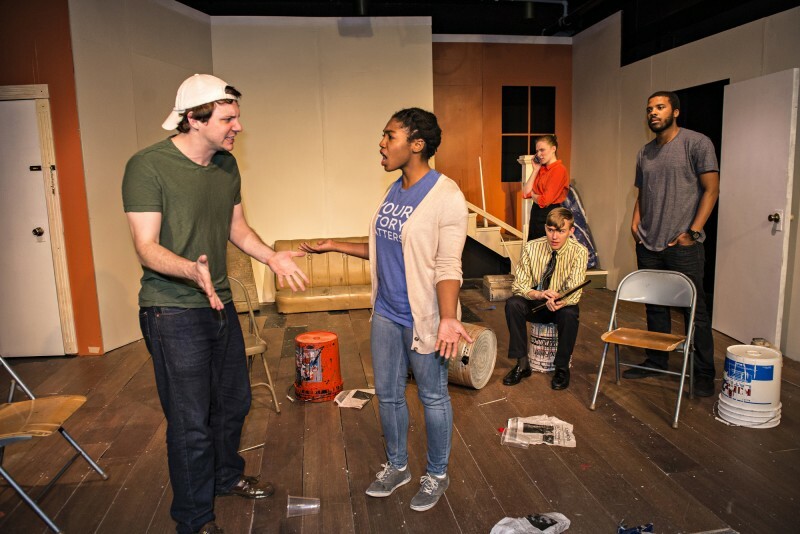 This weekend, a student-produced play at University of Lynchburg transports its audience through time to laugh, but also to think about social justice, racism, and real estate. Clybourne Park, the Pulitzer Prize-winning satire by Bruce Norris, tells the story of one Chicago house in two eras. In 1959, a white neighbor tries to convince the owners not to sell the house to a black family. Fifty years later, the roles are reversed and a black couple tries to prevent a white family from razing and rebuilding the now-dilapidated home, which they fear would lift property values and price them out of the neighborhood. The show opens on Friday, April 17, at 7:30 p.m. in the studio theatre, Dillard 100. The show will also play on Saturday evening and on Sunday at 2 p.m.
Branham became aware of Clybourne Park when he was doing research after seeing A Raisin in the Sun on stage at Lynchburg’s Heritage High School, his alma mater, several years ago. He learned that Clybourne Park was written as a response to that play, which tells essentially the same story as the first act but from a different perspective. Branham said he hopes Clybourne Park will help the audience reflect on the realities and consequences of racism. Clybourne Park is produced by Alpha Psi Omega, the National Theatre Honor Society at University of Lynchburg.